After two months of drought, we are getting periodic rains. Whew, it sure was dry! In the North garden (where we can’t water) the ground was cracked like Death Valley. Yep, crops out there are struggling. But the pumpkins and squash don’t seem to mind a bit. Harvest season is fully upon us and boy, are we running crazy around here. 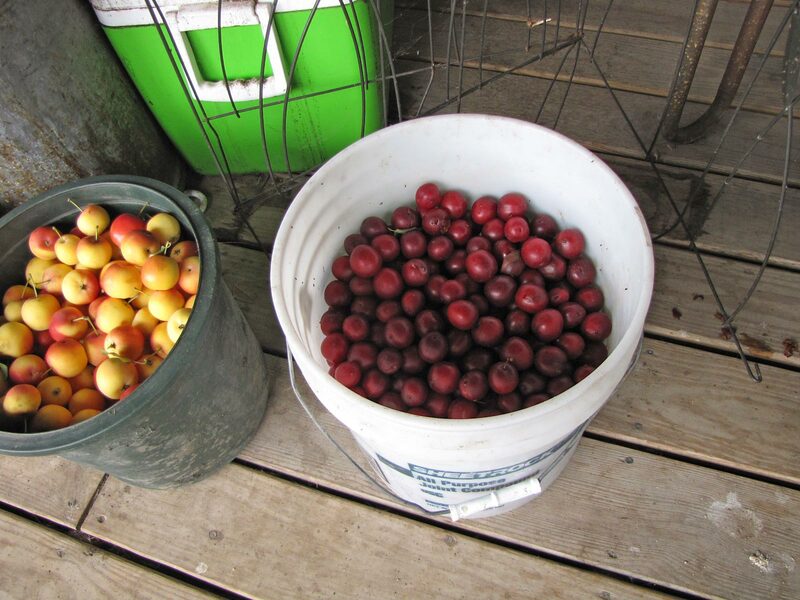 Will went out and picked a 5-gallon bucket full of our wild plums as they were starting to drop from the trees. So I made my first batch of wild plum jam. It takes quite a long time to pit those plums as they are clingstone and fairly small. But boy, are they ever sweet. I do have to eat a few to do quality control, you know… And, yes, I’m saving plum pits for those of you who want to plant your own plum grove. (Remember, the pits have to be cold stratified in order to germinate.) So if you plant plum pits, you should do it this fall or hold them in the refrigerator or freezer until spring so they “think” winter’s over and spring is here when you plant them. We have to watch or the chipmunks and squirrels will dig them up before they sprout so we always plant extras. We’ve got lots of wild plums and apples to process. The apples are Trailman crab apples. So sweet! Our Seneca Sunrise sweet corn is fabulous this year. And it’s open pollinated so we save our own seed too. Son, David, started a new job a week ago. He liked building log homes but there weren’t any benefits and the pay just wasn’t enough. So he is now working at Ziegler Cat in Bhul with more pay and great benefits. He’s always liked working on heavy equipment and now he’s working on mine dump trucks with cabs 24 feet wide! A bonus is that Ziegler is only 22 miles away instead of 30+ so he’ll save gas and wear and tear on his car. On Saturday David and I went to Menards and he bought the rest of the floor joists for the second floor of his cabin plus enough OSB to sheet the walls on the second floor. Ashley’s dad is going to come over Labor Day weekend and we are hoping to get not only the second floor walls up but also the rafters for the roof. Sunday, David got the rest of the floor joists nailed in place and much of the second floor sheeted with plywood. (Of course it rained … the first good rain we’ve had for weeks and weeks.) But David worked until dark and got a lot done. 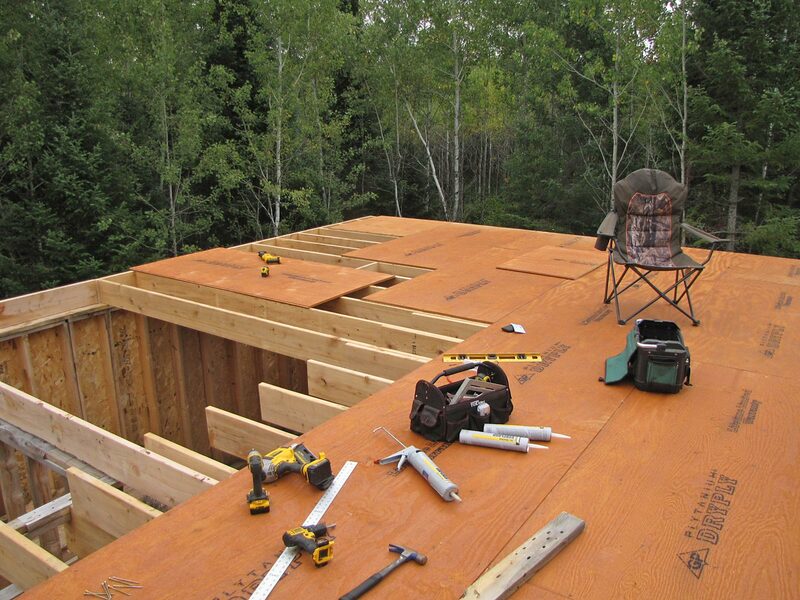 He’s also got the deck built in the front of the house and most of the 5/4″ deck boards screwed down. I’m sure he’s feeling pressure as winter’s coming. The second floor is almost finished on David’s new cabin. We’ve been eating a lot of tomatoes out of the garden as we are inundated with tomatoes! Yep, we had big bacon and tomato sandwiches with delectable Bill Bean tomatoes. My, but they tasted good! The plants are simply loaded with giant tomatoes … probably 30 pounds or more per plant. We’ve also got a slew of new tomato varieties which are producing very well and taste great. One of them is a Brad Gates bred tomato, Lovely Lush, which is absolutely gorgeous with near-brown shoulders and orange-red bottoms. They remind us of Halloween! And they taste great too. Boy, are we happy to have so many different, wonderful tomatoes! 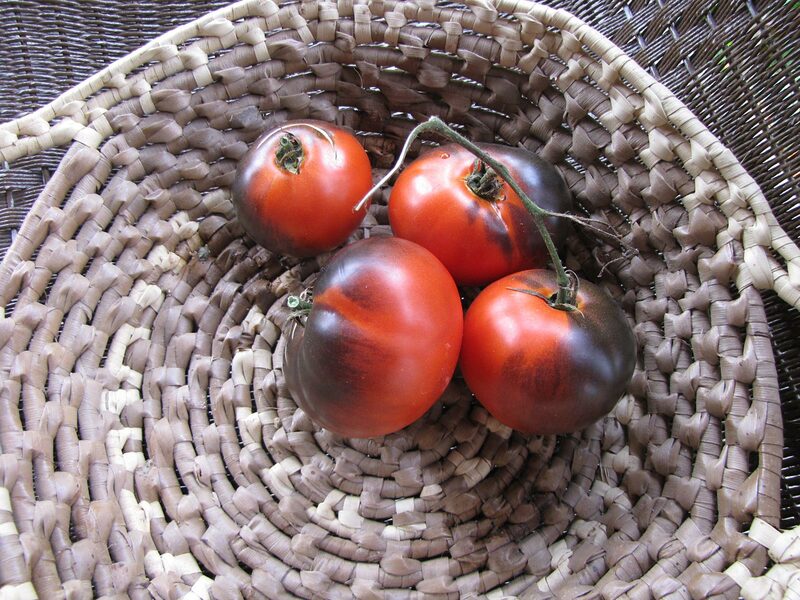 These are Lovely Lush tomatoes. Aren’t they gorgeous? We’re pretty sure he will have it dried in with plenty to do after winter hits. We’ve got a huge work weekend planned for this weekend. I have said several prayers for David and Ashley to have the walls up and be under roof before the Minnesota winter makes an appearance. David’s job sounds great! Thank you for your prayers. I’m sure they’ll help a lot! Hi. Im glad im not the only one with tomatoes that wont set fruit. It finally down to 60 and we have tomato plants growing again. Yep, tomatoes sure don’t like real hot temperatures. Neither do I! Yes we complain when it hits 85 but we laugh when folks complain about only -20. We have seen -55 at this location and -65 when we lived in Delta Junction. South central Alaska has been having what they have been calling an atmospheric river and two out of three days have been heavy rain for the last week. Also haven’t seen temperatures above 60. Finally have a few ripe tomatoes,the really big ones don’t work up here because the season is too short and even in the greenhouse too many days and nights are too cool and fuel is too expensive except for staving off frost to extend the season. Howard, some years ago I read an article about having caged rabbits attached to a greenhouse and a fan behind them to blow the warm air from their body heat into the greenhouse. They can eat the produce and trimmings you don’t. Then if it gets too cold for them you eat them. Sounded like a cheap way to heat a greenhouse but I don’t remember where I read about it. Probably easy to find instructions via Google. Howard, you also might look into hot boxes if you have access to horse manure. The oldtimers used this method to raise the heat in their greenhouse beds. I’m sure Jackie can answer how to if you send it in to her Ask Jackie column . Zelda, that might work in milder climates but no amount of rabbits will keep an Alaskan (or Minnesotan) greenhouse warm enough not to freeze in the winter. I totally hear you, Howard. I remember, years back, when we lived south of here, in Sturgeon Lake, taking a photo of our indoor/outdoor thermometer. In the greenhouse, it was 55 above and outside, -55. We heated with wood but even that made way too much work stoking the fire out there four times a night when it was so cold. They say hell freezes over at -55 and in Minnesota, farmers just put on another sweatshirt. Jackie, just want to say the Barry’s Crazy Cherry tomatoes I got from you and Will this Spring have produced like crazy here in Zone 8b. They are now my wife’s favorite cherry tomatoes. The Bill Beans have not done well. I have one plant with a single 5″ diameter tomato on it. The rest have been small 2″ or a bit more and not very many of them. The Hopi Grey squash has grown vigorously but has produced few fruits. Those squash have been of the ten pound variety however. Any good recipes for cooking them? I’ll probably use at least one for pie and can some. I’m very surprised at your Bill Beans! Folks all across the country are sending photos of really big, really productive Bill Beans. One thing I’ve learned is give all new varieties a second year as some years a certain crop just doesn’t make. We usually cut our Hopis in half and bake both halves, with one half baked with butter and brown sugar and the other half plain, used later to make “pumpkin” pie. You’ll love them! A recipe for our pie is in both my book, Jackie Clay’s Pantry Cookbook and Backwoods Home Cooking. 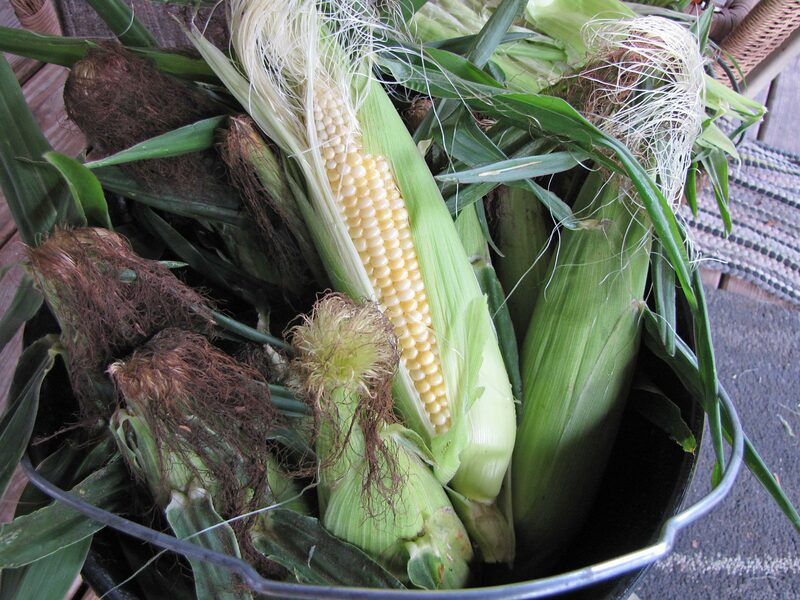 Give our Bear Island Chippewa flour corn a try. We really like it a lot and it produces quite well for us. Working on planting fall and winter gardens here in Texas……… Yes, I garden year round. Sadly, the big tomatoes do not produce here. Once it hits 90, they don’t set fruit. We have had around 20 triple digit days here this year and here on the porch of the milk barn (Nubian goats) we did see 111 one day……… Makes me laugh when folks complain a about the heat when it hits 85. And no, I don’t have A/C. You’re right; a lot of tomatoes blow their blooms and don’t set fruit in high temperatures. Many squash do the same thing. And, yep, I’m one of those people who swelter at 85 but I LOVE 55 when many folks put on a coat. I wear a T shirt! I purchased a plum putter on Amazon it made doing my wild plums so much faster. I saved because it was $50 but it always seems my plums are ready when the rest of the garden is coming off. Oh yes! I’m in the same fix; everything’s coming in like crazy right now. No complaints, though. We’re truly blessed with such an abundance. We are still hot and muggy here in Iowa. Our green peppers and poblanos are ‘coming on strong! I did bag them up and froze to save for winter when I really want to heat us the kitchen to make chile rellanos! Now you made me drool! Chile rellanos….Oh my.